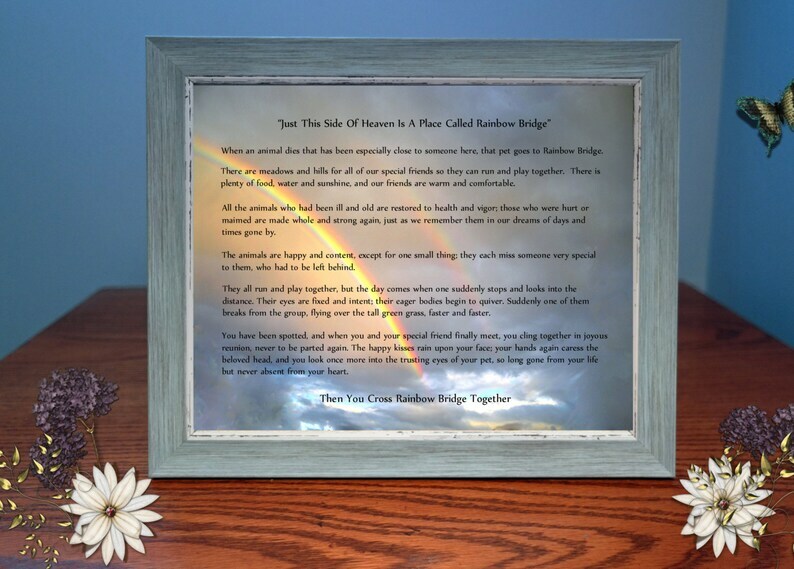 Rainbow Bridge Sympathy Gift - Poem & Photo Gift for pet loss. Can be personalized with pets name. Beautifully framed photograph and sympathy poem. Send to someone who has lost their beloved pet or keep as a memorial gift. Full unisex Rainbow Bridge poem reads: When an animal dies that has been especially close to someone here, that pet goes to the Rainbow Bridge. There are meadows and hills for all of our special friends so they can run and play together. There is plenty of food, water and sunshine, and our friends are warm and comfortable. We offer high quality picture frames that can stand alone or be hung and high quality professional prints. Our Silver Brushed Frame, Black and Silver Frame and Blue Frames have velvet backings. All of our frames have the hardware attached to be hung.